Yes, and They're Finally Mine! I'm finding myself reaching for "Benefit's They're Real!" more and more often. 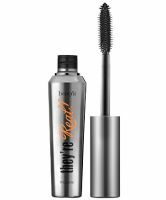 The formula is excellent at separating each and every lash, coloring, lifting, and adding a good deal of volume. I can use it on bottom lashes without fear of crumbling or dreaded "raccoon eyes." The formula lasts through long days and nights (and, yes, sometimes overnight when I fall asleep without removing makeup--...read morea shame, I realize). I bought the trial size of this at Sephora and went on to purchase the full size. Beware; as with any mascara, discard after a few months or if you detect a strange scent. I am OCD about germs, especially around my eyes. There is nothing special about this mascara. There is no lengthening and thickening. Maybelline is better. This is vastly over priced and over rated because it is Benefit. Try Urban Decay "Big Fatty." Terrible name, but it's a lengthening and thickening mascara for $20. I got a deluxe sample of this and it's surprisingly a great mascara. The brush resembles Diorshow Iconic with long thin bristles (Iconic has more bristles though). This is meant for lengthening, separating, and supposedly adds a slight curl. It's not waterproof (I normally use the Iconic in Waterproof which is a PAIN to remove), but this is one of the best NON-waterproof formulas I have used. Ther...read moree is NO flaking and it really does last ALL day, but it's much easier to remove unlike waterproof formulas. I love it.